On August 24, 1996, OS/2 users now had the ability to make OS/2 work the way they do. . It allows corporations to use the applications that work best for them. It makes it easy to standardize on a single desktop. It secures your desktop(s) while making them easier to work with. It allows you to improve your systems performance. It can even backup your entire system to tape, floppy, and network drives. Object Desktop Professional is Stardock's answer to the most common challenges most professionals and corporations face every day in a single product supported by OS/2's leading independent software vendor. Object Desktop Professional represents Stardock's new flagship product. Object Desktop is an advanced desktop environment that is only available on OS/2 Warp. It uses IBM's System Object Model (SOM) and the Workplace Shell (WPS) to add features, power, ease of use, and performance to the base operating system. Object Desktop is targeted at all users of OS/2, but particularly those on small networks and in the home. It has been the top selling OS/2 product world-wide since its inception. In fact, in some retail channels, its sales rival OS/2 itself. The reason for Object Desktop's tremendous success has a lot to do what Object Desktop accomplishes: in essence, Object Desktop provides the features that end users, corporate users, and reviewers have been asking for in OS/2 for a very long time. As one reviewer put it, "Object Desktop is like a third-party upgrade to OS/2." Because Stardock uses IBM's SOM and Workplace Shell object classes, Object Desktop is not version dependent. When new versions of OS/2 are introduced to the market, Object Desktop will automatically inherit those new features and extend them as well. While Object Desktop has been a tremendous success in the end user OS/2 market, corporate users have asked for features whose benefit are readily apparent. Features such as the ability to secure the desktop, read virtually any type of file format, robust backup, training cost reductions, and so on. To this end, Stardock began the project code-named "Milamber" (which many net users have heard discussed) which would address these needs. Object Desktop Professional is the result of this effort. What is in Object Desktop Professional that isn't in Object Desktop 1.5? Stardock recognized that corporate users demand features beyond what is provided by Object Desktop. While a myriad of productivity tools are available that address computing productivity issues, a single solution that provides the absolute best in quality, reliability, and integration is usually preferred. Moreover, Object Desktop Professional offers features that are simply not found in any product on any platform. In essence, if your corporation uses OS/2, then your corporate desktops should be using Object Desktop Professional. Object Desktop Professional integrates document viewing into the base operating system. Hundreds of file formats are now recognized automatically when you double click an object on the desktop. Using Object Desktop Professional, computer users will no longer have to worry whether they have Word Perfect 5.1 on their system when someone gives them a disk full of documents. Presenters will no longer have to worry whether the presentation they give is in PowerPoint or Freelance. Object Desktop Professional doesn't just support a few of the most common file types, it supports hundreds of file types from databases, word processors, spread sheets, internet, graphics, presentation packages, and more. The basic rule of thumb is, if the format has ever had an installed base of more than 50,000 users, it's probably supported. Object Desktop Professional assigns new default icons to common data types! Reading several file types at once.! Both IS managers and end users often find it necessary to secure and protect their desktops. Object Security offers an impressive array of features that allow administrators to prevent custom desktop environments from tampering. Object Security can keep icons from being moved, deleted, changed, etc. IS managers in particular will like the ability to "keep their users from messing up their system." Any end user that shares his or her system with others will also appreciate the ability of securing and protecting their desktop. Lock objects and folders with password protection! One of the more anticipated features of Object Desktop Professional is the Desktop Backup Advisor which can perform two important functions. First, It allows users to quickly and easily manage, backup, and restore packaged desktops. Having a ôwizard-likeö user interface, the desktop backup advisor is very easy to work with. Users and/or IS managers can easily package and distribute desktops across the enterprise using the Desktop Backup Advisor which uses Stardock s advanced Object Packaging technology. Corporations looking to deploy a standard desktop will find the Desktop Backup Advisor an essential tool to this end. One test site has used the Desktop Backup Advisor to deploy a standardized desktop with three variations -- one for technical users, one for their end users, and one for managers. When a new machine goes on the network, they open the Desktop Backup Advisor, choose the desktop they want and it unpackages it. Secondly, it completely repairs OS/2 INI files. The most common cause of system instability and performance loss are damaged INI files (os2.ini, os2sys.ini). Over time, OS/2 INI files collect a great deal of unused 'junk' that can slow OS/2 down and make odd behavior creep in. While INI repair programs go far to help the situation, there is no replacement to being able to totally cleanse the INI files without losing user customizations. The desktop backup advisor, simply by restoring a desktop, completely cleanses the INI file and ignores all the damaged and unused data. The net result is that a system that has used the desktop backup advisor behaves like a freshly installed OS/2 system without losing any of their class registrations, customizations, or their desktop. The beauty of the Desktop Backup Advisor is that it itself is a tool used to backup and restore your desktops but the very fact that when you use the tool it cleans your INI files almost sounds too good to be true but it s not.. ôI have seen 486 systems that were crawling and would have weird errors pop up on a daily basis get a big performance boost and become rock solid simply by using the desktop backup advisor. It s a lot easier than reinstalling OS/2 from scratch and a lot cheaper than buying a new machine. A user may want to do a backup, a virus scan, an defragmentation of the hard disk, and begin compiling in the background. Another user may want to run a script that resorts the database and charges batches. Another user may want to run a program that downloads email automatically. What do all these have in common? They are tasks in which human intervention is not necessary. Yet, users end up having to have these tasks running in the background during the day. Luckily, OS/2 is a great operating system for multitasking but even OS/2 will slow down if you have tasks running in the background. Enter Object Schedule. With Object Schedule, a special OS/2 folder that has much in common with the Startup folder, users simply drag and drop their programs into the Object Schedule folder and assign a date and time for the program or job to run. In the above examples, the virus scan, backup, database update could be scheduled to run at 3:00am when no one is using the PC. When the user returns in the morning, the job is completed. Object Schedule is easy to use and helps automate your office as well as your desktop. The Object Advisor is possibly the most innovative feature of Object Desktop Professional. This advanced technology is intended to address the huge costs associated with training and re-training end users in corporations that have any amount of turnover. The Object Advisor feature allows corporations to develop custom computer based training materials that display when a user doesn't understand how to perform desktop operations. The on-line help technology provided with Object Advisor is authored with industry standard Hypertext Markup Language (HTML), which allows for leveraging next generation internet/intranet technologies in a corporate environment, including new internet features such as JAVA. It truly demonstrates the benefits of the web/internet in a way that anyone can appreciate. An end user is unfamiliar with new procedures in a particular workgroup, or is a new employee in the corporation. Object Advisor is opened in its "trainer" mode. When the user clicks on an object, a small window appears displaying information on that object using rich text, graphics and multimedia. After reading information stored on internal networks about the jobs the worker is attempting to perform, the end user easily able to begin work or find more information on how to proceed. After a while, the end user is stuck once again, and determines that their host connection to the corporate mainframe isn't working. The user reads information provided in the "3270 Connection" object, and after realizing there are still too many questions to begin work, submits a problem report over the corporation's internal intranet by filling out a "web" form that is linked to every help object on the desktop. Immediately, a corporate help desk is notified of the problem and can resolve the problem with a simple phone call. An IS manager creates advisors for all the network resources (eg. printers, modems, etc.). If a user has a problem printing, the training view is opened, and custom help is available for the desktop printer objects. When no paper arrives at the network printers, the end user can fill out a HTML form linked to the printer objects on the desktop that notifies the network manager that there is a problem with the printer. When implemented properly, the Object Advisor feature can greatly reduce the funds needed to staff network help desks. Your company's new software product arrives with an Object Advisor. Now, when your users have questions on how to use the new product, the trainer is invoked, and up-to-date information is displayed for the application which links to external resources that provide Frequently Asked Questions (FAQs) and answer resources, the latest fixes and patches for the application, internet technical support, problem submission, and help databases. Your company's custom software products interact with a highly tailored desktop which provide end users with a complete work environment, including workflow, fax, and other office automation capabilities. End users are presented with a custom Workplace Shell training capability that grows as new features are added to the desktop, and whose administration is centrally administered. A large company with significant turnover can spend millions of dollars over time retraining users on how to use their desktop. Object Advisor can make retraining exceptionally easy by providing a global method of obtaining help that is dynamically updatable and interactive through centrally stored advisor data located on any network file server. In the future, as JAVA becomes more successful, JAVA applets can be embedded in an object advisor to create truly interactive training materials through live application interaction. Object Desktop Professional provides advisors for most of the default OS/2 objects. Stardock Systems indends that third parties will create advisors for their program objects when they are installed on the desktop. To this end, Stardock is committed to making Object Advisors available on multiple platforms such as Windows NT, Unix, Windows95, as time goes on in order to standardize this revolutionary technology. Object Advisors can greatly reduce training and internal help desk costs! Third party products can come with Advisors. While backup solutions exist in many forms on OS/2, the powerful easy to use Object Backup feature integrates itself with the OS/2 desktop and even supports the new ATAPI/IDE standard. 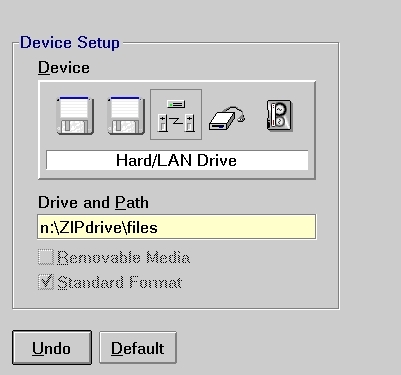 Users can now backup their system to floppy, tape, and/or network drives. Object Backup is not a "lite" backup package--feel free to compare the included Object Backup features head-to-head against any backup package on any platform. Stardock does not plan to support all tape devices, however. For example, we don't (and do not plan) to support the older floppy-controller tape drives (usually QIC80) for reliability reasons. Backup your system (or parts of it) to tape, floppy, or network drives! Object Navigator Professional not only is a powerful and intuitive file manager that can see long file names on FAT, works with OS/2's associations (and is the only commercial OS/2 file manager available that does that), makes working with multiple drives easy, but now, in Object Desktop Professional, users can quickly and easily view virtually any type of file. Object Navigator Professional allows users to open of a "View Pane" that is part of Object Navigator Professional. When the user double clicks on a file (any file) it will read it, interpret it and display it. Whether it's an Excel95 spreadsheet, an TIFF graphics files, a Power Point for Macintosh presentation, or even a Windows 3.1 DLL. Object Navigator will read and display it in a flash. The view pane's performance is quite impressive. Within a second, users can jump from file to file and it displays that file with all the appropriate formatting, embedded graphics, etc. Object Navigator Professional works very well with compressed files such as PKZIP (.ZIP) files. It can view a ZIP file even faster than Object Desktop's own Object Archives by trading off the folder metaphor for raw speed. Users who have a large library of documents, graphics, etc. in ZIP files can now quickly browse them and view the files they want saving many megabytes of disk storage. Browse through hundreds of ZIP files quickly to find the file you want. 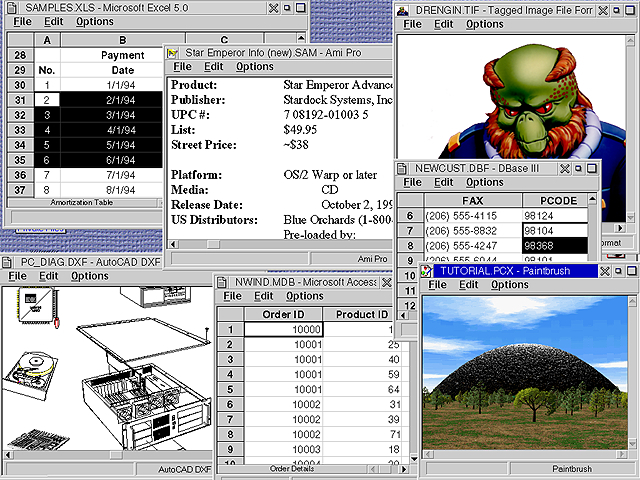 Viewing the information on a Windows 3.1 DLL file. Looking at a document written in Word 6.0. Anyone trying to manage an OS/2 desktop knows the difficulty of working with Workplace Shell objects. Finding out an object's "low level" settings can be frustrating and time consuming. Network managers spend countless hours setting up workstations so that they are easily used but standardized to a corporate reference point. Object Inspector provides the tool to make these chores easy. To discover any object's "under-the-cover" properties, simply load the Object Inspector and Workplace Shell objects are instantly displayed and presented in an easily manageable form. Users can even create REXX or RC scripts to regenerate objects across an enterprise. 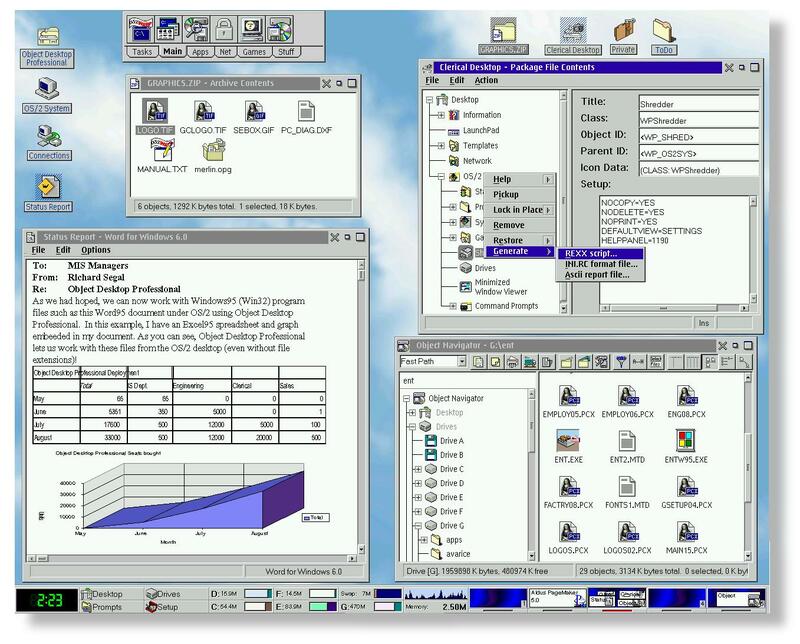 Object Desktop is Stardock's offering as the "next generation" desktop environment for OS/2. We have been successful in bringing powerful new ease-of-use features to the OS/2 market, as well as enabling new ways of using the OS/2 desktop environment. Object Desktop is intended for OS/2 users who work in small offices, or home offices, or for mobile computing users who want the best in desktop power. However, Object Desktop Professional is intended for a different type of user. Stardock Systems created Object Desktop Professional to address the concerns of corporate users who are connected to large information resources and who exchange information with a workgroup or an entire corporation. Object Desktop Professional is a must for corporations who standardize their desktops and want to reduce their desktop management costs. These same corporations can leverage intranet technology for reducing their training costs through our powerful computer-based-training features. 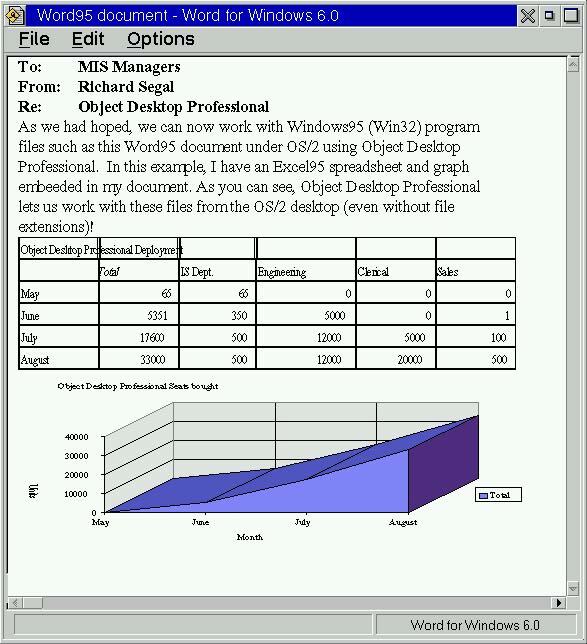 Object Desktop Professional is also targeted at the professional OS/2 user or "Power User". Professionals using OS/2 for consulting or to improve their own productivity realize that the benefits of Object Desktop Professional are well worth the cost of entry and will find it a "must have" product for their needs. Object Desktop Professional is a significant step forward in creating a corporate environment that is more productive, more reliable, easier to work with, and secure. It provides the features and function that corporate users desire, while reducing desktop management and training costs. See Stardock's website (http://www.stardock.com) for more information on the Object Desktop family of products. For more information, please feel free to contact our Vice President of marketing, Alexander Antoniades, at either at (313) 762-0687 or sander@stardock.com. For site license opportunities, contact Stardock's Worldwide Executive Sales Manager: Maurice Saylor: 703-404-4274. The value of Object Desktop Professional is tremendous. Even if only a few of the features of Object Desktop Professional are used, it still provides a lot of "bang for the buck." Order Object Desktop Professional at the special pre-release price!